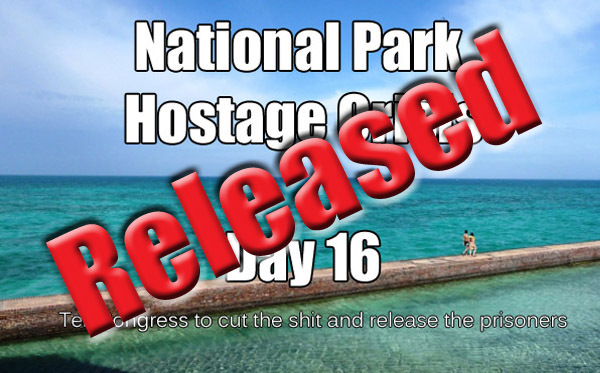 By all accounts the National Parks Hostage Crisis is coming to a close. The good news is that our wonderful parks are unharmed. The bad news is that plenty of other innocent bystanders are not so lucky. While we waited for our parks to reopen we had the good fortune to meet a couple of blog followers who had flown to the U.S. from Australia. The highlight of their time here was supposed to be a 13 day rafting trip through the Grand Canyon. After “years of dreaming, more than a year of planning, researching and booking, thousands of dollars saved, thousands already spent and over fifteen thousand kilometers traveled,” the high point of their trip to America was canceled due to America’s inability to govern itself. Sadly, they were not alone. At the outset of this spectacle we were called selfish by some for decrying this kind of hardship that such a senseless shutdown would so obviously cause. The word irony apparently has lost all meaning. Of course we now know the damage done goes well beyond wrecked vacations. It has also hurt our economy, destroyed research projects, upended people’s lives, tarnished America’s reputation in the world and even damaged our nation’s credit rating. And now that it is over, we can say with absolute certainty – indeed it is the one area on which everyone seems to agree – that not one single good thing came as a result of this national temper tantrum. It was 100% waste. The best we can hope for is that the harm done is sufficiently painful to prevent similar tantrums from happening in the future. I’m hopeful, if not optimistic. And so, with the reopening of our National Parks this politicized chapter of our travel blog thankfully comes to a close. We’ll soon continue our journey to Kings Canyon and Sequoia National Parks. We look forward to sharing them with you in the future. It is a disservice to categorize this as “America’s inability to govern itself.” This was a problem caused by congressional Republicans. No good will come from shying away from that. Note that we specify congressional Republicans. For a level-headed assessment of this embarrassing behavior, see (Google) Brian Williams’ brief interview with Senate Republican John McCain of October 16. And what a humungous waste of time and lost tourist dollars that was. Hope they have scars on their hands after that farce. What’s really sad is that the vote to end this mess (reopen the government, raise the debt ceiling, and not much else) passed by overwhelming margins (81% support in the Senate and 66% support in the House.) Why couldn’t they have just done that back in September and spared us all the pain and drama? Because the Tea Party, apparently, had to have its temper tantrum. Then Boehner had to say, “well, we fought the good fight, but we lost.” What a bunch of morons. I’m still in awe that 144 Republicans in the house voted AGAINST reopening the government. Do their constituents really feel that way? Some clearly feel that way. But the vote against this deal is even worse than a vote to keep the government shut down, it was a vote to breach the debt ceiling. That’s a vote to head off into uncharted territory. Very scary stuff. And yet there are those telling themselves, and each other, that a breach of the debt ceiling, the resulting immediate curtailment of 1/3 of all government spending and a potential U.S. Treasury Default were nothing to worry about. Some actually wanted that outcome. There is nothing “Conservative” about that stance. Speaker Boehner knew he could have passed back in September the Senate continuing resolution with the help of Democrats in the House. He chose instead to kowtow to the worst crazies in his party and drive America to the brink of disaster. This is the man who was also in the Republican leadership under Speaker Newt Gingrich when Gingrich tried to shut down the Clinton government and failed. He knew this would end in failure but decided to fall on his sword for the crazies anyway just to keep the Speaker position. It unfortunately looks like that strategy has worked for him. Just remember to plan your upcoming national park visits around the next go-round of this fiasco. We will sadly have to do this all over again next year. Enjoy Sequoia and Kings Canyon. I haven’t been there since the 70’s and they are probably just as beautiful. That’s not a bad strategy Ray. But I honestly don’t think it will be necessary. Sure they’ve only “kicked the can down the road” a few months but the dynamics are different. It’s true that the group of deadenders who want to burn down the house to get their way haven’t changed their minds or their tactics. But after trying, and failing, they have far fewer allies or willing idiots to help them carry it out today than they did in September. Next time around Cruz will still cause a stink, but almost nobody will be listening. Even fewer will follow. I so hope you’re right.